Recently, I got chance to integrate feature flags into a mobile app I work on. The idea of feature flag is simple, it lets you enable and manage features in your mobile app remotely without requiring a new release. Let see the benefice of it and how integrate a feature flag solution like Apptimize’s one. Here is some context: you already have an app available and you add new feature for next update. However, you don’t know how your users are going to interact with it or you don’t want to affect all your users with it. 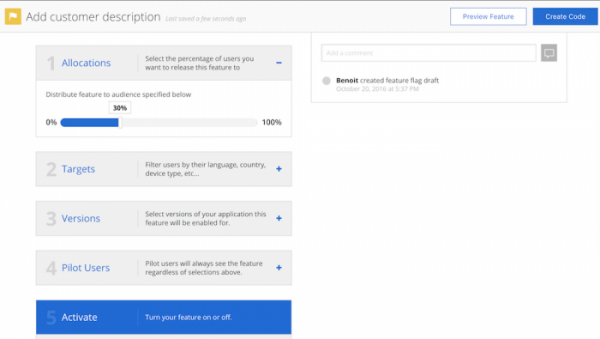 Here is feature flag: a way to manage the access to any features for every users. I’ve already seen feature flags in action in some of my jobs, mostly an homemade solution in a backend linked with the mobile app. Detecting a boolean, the app will display an extra button to access to a new feature. Catching a bug ? You can switch it off to reduce the impact on your user. Then I found Apptimize solution and wanted to give a shot with their 30 days trial. There is nothing specific to do in the installation, just a cocoapods line and an API key into your plist file and you’re all set. 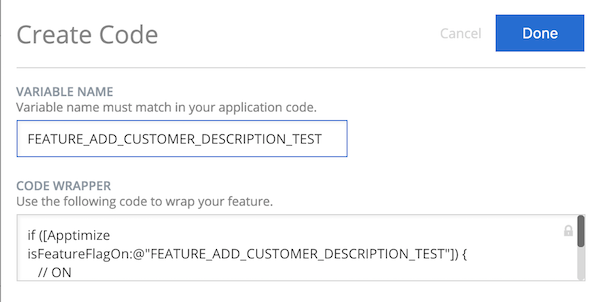 Into Apptimize, you can easily create a flag for a feature, adding name, tag and description to it, even a screenshot can be uploaded. If you already have an app launched and deployed, you can preview the feature and see how your final users are going to access to it. There is even a code provider to integrate it into your app. First, I had feature flag in mind it could be useful for user testing and help avoid mistakes after deployment. However, Apptimize seems to be more designed for a marketing goal: you can target specific users or versions. You can also define a percentage when deploying it, really useful to not overload a new service on your backend. Once your draft finished, you’ll be able to manage every one of your feature into your Dashboard, really easy to see and know how the deployment is going. At the end, integrate flags into your mobile apps to keep control of your feature is really useful to keep the best user experience but also a good tool for user testing and see how it can impact your backend. There is many way to integrate a feature flag solution but Apptimize provides really good tools to do so.